Tamil Nadu Chief Minister requested Modi for the required relief fund for the places and persons affected by Ockhi cyclone. Prime Minister early this morning had reviewed the situation arising due to cyclone at a high level meeting in Lakshadweep. 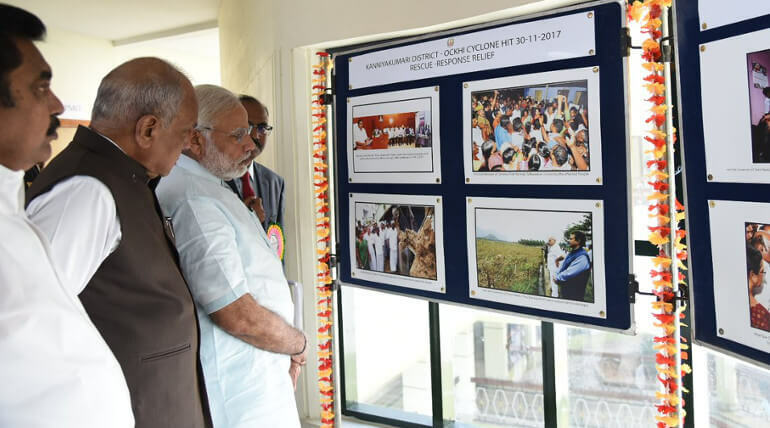 As a one-day visit PM Modi also visited Kerala following Lakshadweep and reviewed the Cyclone Ockhi relief works. Now Modi is at Kanyakumari with AIADMK leaders. PM Narendra Modi reviews Cyclone Ockhi relief operations in Kanyakumari. Tamil Nadu Governor Banwarilal Purohit, Chief Minister Edappadi K. Palaniswami, Deputy Chief Minister O Panneerselvam are also present. He met victims' families in those places. He had meeting with 8 fishermen families in Kanyakumari. CM Edapaddi Palanisamy had demanded Rs 4047 crore as the relief fund for the cyclone affected areas in the state. He also met officials and public representatives. Prime Minister after winning Gujarat and Himachal Pradesh elections found time to visit cyclone affected places. He had reviewed the situation in the aftermath of the disaster Ockhi that hard hit between Nov 29th and Dec 6th. As per the earlier reports, 619 fishermen are still missing including 433 Tamil Nadu fishermen and 186 Kerala fishermen. As per latest report from reliable source co-fishermen had rescued 10 fishermen in the sea today.